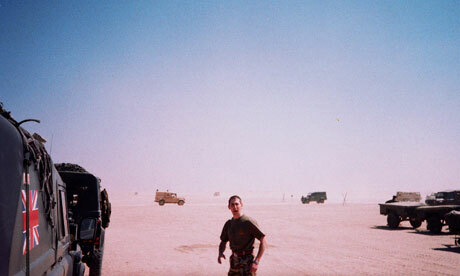 One of the last pictures taken of Sapper Luke Allsopp, who died in Iraq in 2003. Photograph: Adnan SarwarLuke Allsopp was a friend of mine. The last time we spoke for any length was in February 2003. Around three in the morning I woke hearing him struggling to stand and giggling. I saw him confused and braced against the wall. I called out, he turned and asked me why I was sleeping in the toilets. I told him it was my bedroom. He needlessly told me he was drunk. We were both soldiers in the Royal Engineers. He was what you might imagine your average squaddie to be: hard-drinking and full of life. I was not so much your average squaddie: a Pakistani immigrant who had joined the British Army looking for adventure. He sat on the end of my bed and told me he was worried. We had just been told we were going to Iraq. The lads had responded to this news by going out into the local town to drink the bars dry. Now, here was Luke, his behaviour the result of a heavy night numbing reality. I prepared myself to hear my friend talk about how he was worried about his family. But, he didn’t want to talk to me about that. He told me he was worried about me. He asked me why I didn’t drink or sleep with anybody. I told him it was my religion. He laughed and asked if I actually believed in all that. He told me how life was too short, how we were off to Iraq soon and how embarrassing it would be to die a virgin. Only a soldier could have put it so well. I found myself struggling to fault his logic. I had followed Islam for years, having grown up in an area of Burnley that was almost exclusively Asian. My street, a little Pakistan, had rows of terraced houses full of Muslims getting their halal meat from the cash and carry at one end and praying five times a day at the mosque at the other end. Now here, hundreds of miles away from it all, Luke made me question it. Did I really believe in a God? Fast forward a month to the last time I saw Luke. We were painting Land Rovers yellow in Kuwait and preparing to head over the border into Iraq and to war. I took a picture of little Luke standing in that big desert and we said our goodbyes. I ended up being based with the United States marines and he went off as part of a bomb disposal team. Luke was killed in an ambush on 23 of March 2003. With Luke’s words ringing in my ears I asked myself how could there be some guy in the sky watching over this mess? How was there a God who was fine with Luke being killed, fine with the dead, burnt bodies of Iraqis I drove past on my way to Basra? How was he fine with the people who waved crying at us hoping we’d throw some rations and water into their desperate lives? I went to see the padre. Sitting with this devout Christian in the cradle of civilisation, I had the most honest conversation I had ever had about religion. I’d never had the courage to say these things out loud before, but the Padre made it easy. He listened to my angry words and I knew it was okay for me to not believe. For the rest of the tour I spoke to the lads about it constantly, and as Saddam’s empire came tumbling down so did any belief I had in God. Back from Iraq, I met my first girlfriend at the age of 26 and started living my life. It felt right. I didn’t believe in God and wasn’t scared of admitting it any more. I didn’t need a religion and was at my happiest and most content. It might be a hard thing to hear but my religion held me back for years and only when I had the courage to get rid of it did I really start living my life. My new-found honesty gave me freedom and strength. I had realised that I don’t do God. Previous Chinese victims of racist ad campaign?